Any bad eggs in your fridge? Explainer: Any tainted eggs in your fridge? How to tell the plant ID and Julian date (packing date) on a carton of eggs. At least a half-billion eggs from two Iowa farms have been recalled because of salmonella contamination. The Egg Safety Center, a site maintained by the United Egg Producers, has provided a list and description of the affected brands. Dates and codes can be found stamped on the end of the egg carton or printed on the case label. The affected eggs were packed in cartons of different sizes, with various plant numbers and Julian dates (the Julian date is the number the industry uses to determine the packing day). 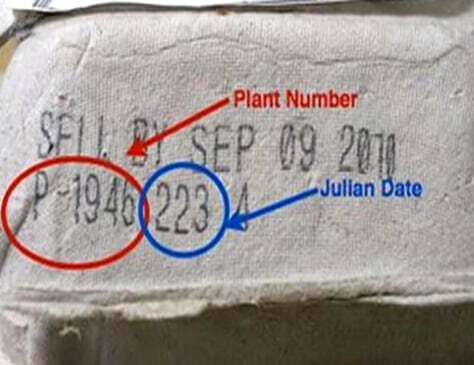 If your egg carton has a combination of numbers that matches the affected plant number and Julian date, it is part of the largest egg recall in history. The tainted eggs were shipped from mid-May to mid-August. Both the date and plant number must match for a batch to be affected by the outbreak. If you think you have purchased contaminated eggs, do not eat them, but return them to the store. Visit the Egg Safety Center for more information on the recall. Read on for a list of the brands affected by the outbreak. The list was updated on Aug. 26.